Current rating of 2.2 to 6.0 amps AC. Inductance of 1 to 33 mH. 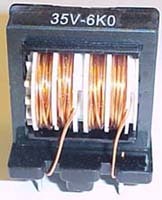 35V Series Commom Mode Filter. Height of 45 mm ( 1.77" ).